Part of the challenge in working through my notes for Havruta with a One-Eyed Cat is the sheer volume of concepts that I’d like to explore. The one I’m currently working on is the notion of Tselem Elohim—the Image of God. It turns out that it’s a surprisingly slippery concept to pin down. That human beings are created “in the image of God” lies at the very foundation not only of the Jewish worldview, but of halakhah and practical law as well. And yet, we don’t have a clue what it really means. Or rather, we have a myriad of ideas what it means, many of them contradictory; and some of them self-contradictory. Rabbis, textual scholars, and philosophers have written reams on the concept, and yet, it remains as enigmatic as ever. 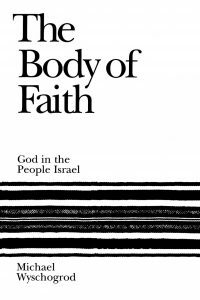 The book was Michael Wyschogrod’s lyrical philosophical work, The Body of Faith: God in the People Israel. Rav Cardozo was right: I’m thoroughly enjoying the ride! Tselem Elohim, according Wyschogrod, refers to man’s unboundedness, his lack of completion. In the terminology of mathematical systems, man is “autonomous”—he is potentially infinite, even while being finite. But there is a darker side to this: human freedom partakes of the chaos at the heart of creation—the capacity for evil as well as for good. In the Song of Creation, with which the Book of Genesis opens, every creative act ends with the poetic refrain: “God saw that it was good”. This refrain is missing from the creation of man; there is no statement that man’s creation was seen by God to be good. Perhaps this is because man is never completed—his essence, in Wyschogrod’s phrase—remains open. This is a stunning g’zerah shava (to use the Talmudic term for such a context-based analogy): just as in the physical realm “seeing requires opacity” so in the metaphorical realm “seeing requires opacity”. But the conclusion would seem to be born out in a myriad ways in the real world. Consciousness would appear to be a reflected image of the body, an image of an image. We become conscious when we reflect our own state back to ourselves. We see ourselves—the map of our nervous system—in the mirror of our minds. Nothing is so startling as the observation: I am! and yet nothing is so trivially obvious when we realize that we are seeing our own reflection. Of course we are! If the image exists then should we be surprised that the reflection also exists? And yet, the miracle lies not in the existence of the reflection, but in our identifying it as our selves. The flip side is that consciousness entails the intimate understanding of not being, the opacity which, in Wyschogrod’s phrase, reason fails to penetrate. Consciousness entails the knowledge of death, and the unimaginable fear of non-being. Not for nothing were we told that death would follow eating of the tree of knowledge; once we become human, we know what it is to die. The other side of knowing that we exist is the fear of non-existence. But the most startling aspect of all this is that reflection and images are at the basis of our consciousness—perhaps the Image of God reflected back to us from the screen of our minds is more than a metaphor; it is the basis our selfhood.